The brilliant colour artwork and exciting ideas in these outstanding activity books makes them a sure winner. Each one is filled with crafts, puzzles, prayers, Bible stories, and Bible activities. 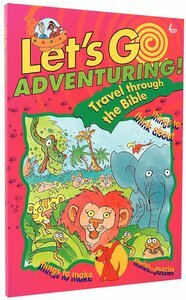 Created by Scripture Union to help children read the Bible on their own or with a parent, they are ideal gift books. Ninety-six full-colour pages of Bible-based activity, divided into single weeks. Children can do one activity a day or a whole week in one sitting, (one week includes a Bible passage, a retold Bible story, a prayer suggestion and puzzles). For children aged 6-9.